AIB’s history is rooted in the agri-food sector. We recognise the key role that we play in supporting the sustainable development of the sector and supporting our customers through the challenges and opportunities that lie ahead. 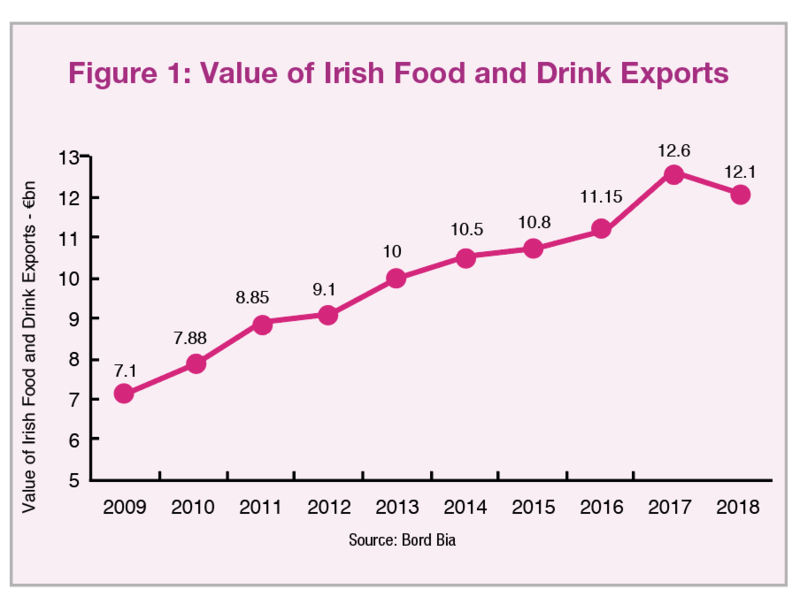 Although still a small producer in a global context, the phenomenal export growth and expanding geographic reach of Irish agri-food exports demonstrates just how well regarded and internationally recognised we are as a consistent, quality, safe and sustainable food producer on the global stage. With consumer sentiment and preferences ever evolving however, the sector will need to continue to innovate and prove its sustainable credentials if it is to maintain its positive trajectory and remain to the forefront of sustainable global food production. Sustainability is a complex concept, with no universally agreed definition. There is however a general acceptance that it encompasses satisfying personal needs without compromising those of future generations. It extends beyond environmental sustainability, which frequently initially comes to mind, to include also social and economic perspectives. Within Irish agriculture, the lack of on-farm profitability, particularly amongst the drystock sectors, has been well documented. In 2017 the average aggregate farm income was €31,374 which was circa. 17 per cent below the average industrial wage (€37,646 as per CSO, 2018). Averages can conceal a lot however as over one-third (35 per cent) of Irish farmers earned less than €10,000 and more than half (56 per cent) earned less than €20,000. Almost one in 10 (7 per cent) Irish farms earned more than €100,000. The dairy sector has consistently been the most profitable farm sector and the cattle rearing sector the least profitable1. In 2017, 91 per cent of dairy farms were considered economically viable or sustainable2, compared to only 58 per cent and 60 per cent of sheep and cattle rearing farms respectively. A key challenge for the sector is generational renewal. With an aging demographic, where there are approximately six times more farmers aged over 65 than under 35 years of age this represents a key challenge, not only for the agri sector, but the wider rural communities who rely heavily on agricultural activities to sustain economic activity. There has been increased incidence of dairy new entrants and collaborative farming arrangements (e.g. contract rearing; farm partnerships; sharefarming, etc.) in recent years, a trend that is likely to continue in the years ahead, particularly when you consider that one in four farms will change hands over the next decade (Ipsos MRBI, 2017) and the macro factors of influence (e.g. Brexit and other trade negotiations; CAP Reform; climate change agenda; income volatility, etc.). Given the importance of the family farm to the fabric of rural areas, and, not to mention our perceived image abroad, it is essential that incentives, such as those offered under the TAMS II scheme, are available for young people to enter and progress their farming careers. Environmental sustainability is one of the most significant issues and greatest challenges facing the agri sector. Agriculture and food production is Ireland’s largest indigenous industry, and, in the absence of any other large-scale heavy industries is the highest contributor to national emissions accounting for 32 per cent of total emissions3. Ireland, and the EU, under the Kyoto protocol, target a 20 per cent reduction in greenhouse gas (GHG) emissions vs. 2005 levels by 2020; and a 30 per cent reduction by 2030. Recent industry reports suggest that despite a gradual decline in emissions since the 1990’s and significant on-farm advances, where 90 per cent of Irish beef exports and 100 per cent of Irish milk production comes from audited and carbon foot-printed farms, our river water quality has started to decline somewhat (from a very high standard) and our greenhouse and ammonia emissions are on an upward trend as livestock numbers and fertiliser usage increase. At a macro level, it is however imperative that rural areas are not jeopardised by actions taken, and that the net benefit of national interventions are not eroded by the market displacement of less efficient global producers, who increase production to meet the demands of an increasing global population. While the above figure of 32 per cent is substantial, it should be noted that Irish produce is some of the most carbon efficient in the EU and our agricultural products have a low level of GHG emissions per kilogram or litre of food output. In fact, Ireland is the most carbon efficient producer of milk in the EU and we are the fifth most carbon efficient producer of beef in the EU. The agri-food sector, through direct employment and its ever expanding array of exports destined for global markets, is central to Ireland’s economic performance. The sector, although presented with the opportunities afforded by a growing global population, faces significant economic, social and environmental challenges in the short-term requiring innovative, holistic, strategic action to address. The sector has shown remarkable resilience in the past and holds the inherent competitive strengths needed to compete in the future. We have a strong global presence on international markets, evidenced by our continual growth in agri-food exports annually in recent years; our grass based production offers us a cheap source of sustainable feed; our mild climate offers stable rainfall patterns and when combined with our good soils provides a key strength in our agricultural production. In AIB, we have a long and proud association with the Irish agri-food sector, at all levels along the food-chain, and are committed to supporting the development of the sector into the future. In AIB we have a long and proud tradition of supporting Irish farmers. We have a Banking relationship with four in 10 Irish farmers and are committed to supporting the growth and development of Irish farming. We have a dedicated Agri Advisor Team based around the country who work to support the needs of our farming customers. They are from farming backgrounds themselves, so they have a practical understanding of the sector and bring a wealth of experience when looking at farm finance. Our team provide strong, objective farm financial and technical analysis on individual farm cases as necessary. Where now for the CAP in Ireland?